Ingredients: Rice Flour, Molasses, Ripe Plantain, Salt, Sesame seed, Baking Powder, Cardamom and Vegetable oil. 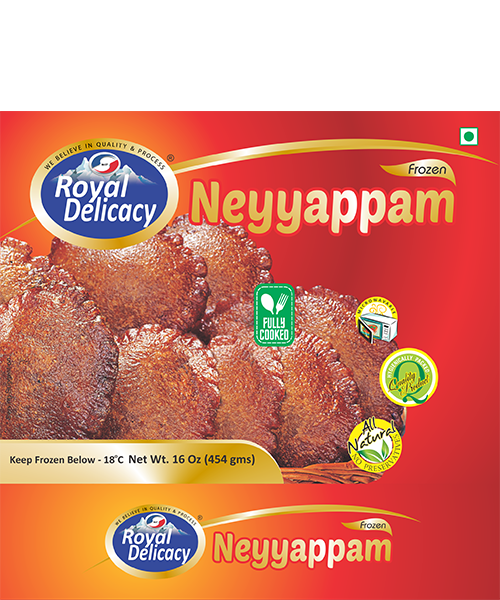 This is to declare that the Neyappam are prepared by the following procedure. Mix all the ingredients together with water to make thick batter. After one hour for one big spoon of batter to hot vegetable oil and deep fry in a medium heat. When one side is cooked, turn and cook the other side till it turns brown color. Then pre-cool the product before blast freezing at -32 °C and pack and stored at – 18 °C. The procedure is carried out so as to assure that the product is free from any type of contamination.